Background: This study aimed to evaluate the risk factors among drivers due to the nature of the job, mostly in groups considered at high risk to design cardiovascular disease management model that is a necessity for our country. Methodology: This is an applied study in terms of objective, it is also a survey study. Data analysis method is correlational regression analysis. The main risk factors for cardiovascular disease include data variables, demographic, and geographical characteristics. We analyze data by t-test and correlation coefficient to test the first hypothesis, ANOVA was used. F value was used to test the hypotheses, and path analysis (estimating by partial least square method) was used to test other hypotheses. In the next step in the modeling, refining, and final variables were used to evaluate the model. Finally, the proposed model was applied. Results: Studies have shown that the average age of drivers was 42.85 years old, the average of work experience was 11.17, and the average of body mass index was 27.8 kg/m2 8/27 that showed an overweight. According to mean values of 79.5 for diastolic pressure and 119.5 for systolic pressure, the drivers are at risk high blood pressure. The average value of triglycerides (TGs) equaled 169.08. Moreover, the average value of cholesterol (CHOL) equaled 179.98 that is over 150, so in this respect, the drivers are at the border risk. The average value of fasting blood sugar equaled 96.19 close to the risk, and the depression equaled 93.47, and the average standard of health is 30–70. The average of smoking equaled 3.46. In addition, according to results of heart disease, on average, 7.8% of drivers suffer heart disease. The main components of risk factors include abdominal fat mass, systolic blood pressure, CHOL, and TGs and geographical factors affecting risk factors including air temperature and wind flow rate. Principal component-associated demographic risk factors include age and experience in driving. Conclusion: The results show that the relationship between demographic variables and risk factors is negative in the sense that the main risk factors among drivers are ages and experience of work. The results have shown that the relationship between the two variables of geographical features and risk factors is negative and significant. The results related to the relationship between risk factor and heart disease are positive and significant; this means that there is a relationship between the model of health management and reduction of cardiovascular disease. This kind of analysis can be helpful in setting realistic goals, diagnosis, and prediction of risk factors and management and futurists of officials; this model can be also effective for other diseases and related topics in the field of health and medical education. This research has been conducted by collaboration with the office of management and budget organization and transport organization. In many countries, noncommunicable diseases have the upward trend that is the main causes for the increase in life expectancy, higher and longer exposure to risk factors, and change the pattern of life. Noncommunicable diseases in 1990 in terms of global burden of disease have ranked in the fifteenth while estimates show that it increased to six ranks in 2020. The prevalence of these diseases in developing countries, including our country, increased the burden of cardiovascular disease and its consequences are significant so that cardiovascular disease is the first cause of death in Iran. Despite increasing awareness of people about the need to prevent heart disease and planning by governments in this regard have done, every day the number of people due to cardiovascular problems, the health centers come in, they added. Some of these people with heart disease lose their lives, and those who survive must take medication for a long time. This condition affects the daily life of patients and their families. Of course, for better and more accurate planning, it is required that the managers have a viewpoint to the vision of cardiovascular disease, especially ischemic heart disease in the community. To achieve this and due to many restrictions on collecting statistics and detailed information, modeling is one of the most common methods for evaluating the current situation and forecasts in the future. In this way, it is tried to design a model of mental illness in the community, and then, by entering parameters, subjective elements are interconnected. After evaluating the accuracy of the information derived from the model not only we can discuss on the model predictions but also by changing parameters in the range of appropriate and acceptable, the effects of general and disease burden in community are estimated. The case study of this research includes the drivers of Isfahan province. As said, the occupational or social groups are at risk for cardiovascular diseases. Since cardiovascular disease due to the nature of the job drivers as high risk is likely more common and according to domestic and global mortality, heart diseases are increasing, so that mortality statistics increase to nearly 23 million in 2030. The result, on the one hand, leads to high costs for the individual and society. On the other hand, many human losses are entered into the system. It tries to assess the causes and management strategies to solve the problem if we neglect seamlessly. Investment in research, early deaths and disabilities and mental health and quality of life and well-being to reduce driving and improves the community. According to the above explanations and to estimate the incidence of cardiovascular disease in drivers and determining the main risk factors for cardiovascular disease, designing a model that can be used to plan and manage cardiovascular disease in drivers. Then, the hypotheses of the conceptual model and to achieve the research objectives based on the formulation of the management of cardiovascular diseases drivers between the city, the hypotheses, and research questions based on the data, the health status of drivers of provinces and inferential statistics were used. Thus, we find that if the demographic factors, geographical features, and risk factors of cardiovascular disease with risk of cardiovascular disease, the relationship is established so that strategies to deal with it for drivers of Tehran provided for the entire country. This is an applied study in terms of objective; it is also a survey study. Data analysis method is correlational regression analysis. The main risk factors for cardiovascular disease include data variables, demographic, and geographical characteristics. SPSS-22 (IBM, USA) was used for data processing. The descriptive data represented in [Table 1]. Then, we analyze data by t-test and correlation coefficient; to test the first hypothesis, ANOVA was used. F value was used to test the hypotheses, and path analysis (estimating by partial least square method) was used to test other hypotheses. Thus, the Bartlett and Kaiser-Meyer-Olkin (KMO) test was done to determine the adequacy of the sampling. Based on the value which is obtained 0.1, the null hypothesis was rejected. In the next step in the modeling, refining, and final variables were used to evaluate the model. Finally, the proposed model was applied. Demographic characteristics of the respondents include cardiovascular disease, risk factors, and geographic features. The total number of data for 10 years covers during 2006–2015. Given that the PLS method was used to examine the relationship between variables, the normal distribution of the observations was not considered. H1: There is a correlation between health management model and cardiovascular diseases. To test this hypothesis, health management is used as an indicator. Then, F test was used to test the correlation. According to ANOVA, there is a significant difference in health management model in provinces. Therefore, the null hypothesis is rejected because F value for cardiovascular disease equaled 18.699 [Table 2],[Table 3]. F value was used to test the hypotheses, and path analysis (estimating by partial least square method) was used to test other hypotheses. Thus, the Bartlett and KMO test was done to determine the adequacy of the sampling [Table 4]. Based on the value which is obtained 0.1, the null hypothesis was rejected. In the next step in the modeling, refining, and final variables were used to evaluate the model. Demographic characteristics of the respondents include cardiovascular disease, risk factors, and geographic features. The total number of data for 10 years covers during 2006–2015. Given that the PLS method was used to examine the relationship between variables, the normal distribution of the observations was not considered. The variables selected have been highlighted in yellow. The variables with the highest factor loading were selected. The rest of study was conducted using partial least square method to estimate the structural equations. In this estimate, the results of the estimation coefficient, a statistic T, and goodness of fit tests are listed. The amount of at least 1.6 at 90% and 1.96 at 95% for the statistic T represents a meaningful relationship. In [Figure 1] and [Figure 2], the overall chart estimating structural equation is shown separately. The hidden variables include demographic factors (such as age and driving record), geographical features (including air temperature, relative humidity, air pressure, number of days without dust in the month, and the average wind speed), risk factors include as follows: the systolic pressure (diastolic pressure), (triglycerides [TGs]), (cholesterol [CHOL]), (fasting blood sugar [FBS]), (depression), and (smoking/year) as independent variables and heart disease (percentage of heart patients in the sample) as the dependent variable. These latent variables and observed variables with the same components presented above for each variable are shown. T value is shown for each variable. Second hypothesis: The results have shown that the relationship between demographic variables and risk factors for cardiovascular disease is negative and significant. According to statistics, the value calculated for t = 7.116 which is more than 1.96, we can say that at least 95% of significance level, the relationship between the two variables is confirmed. The estimated coefficient is equal to −0.884. This result suggests that there is a significant negative relationship between demographic variables and risk factors. This means that the main risk factors among drivers' ages and driving experience are more observed. The third hypothesis: the results have shown that the relationship between two variables, geographical features and the risk factors for more than 95% (t = 0.202) is not significant. The impact of geographic factors on major risk factors for cardiovascular disease should be rejected. The estimated coefficient for variable geographical features obtained − 0.045 that shows the negative correlation between the two variables is undervalued. The main components of an effective geographical risk factors including air temperature and wind flow rate. The fourth hypothesis: The results have shown that the relationship between the two variables and risk factors for heart disease in more than 95% (t = 5.257) is significant. The estimated coefficient for variable risk factor equaled +0.751 obtained. The relationship between risk factors and mediators and the latent variable is positive and significant. The main components with increased risk factors for cardiovascular diseases also increased. According to the coefficients obtained in the model, the most important factors affecting cardiovascular disease in drivers of Tehran include the mass of abdominal fat (obesity), the systolic blood pressure CHOL, and fourth levels of TGs. The numbers shown on the arrow that connects the hidden variables, as well as brackets indicate the estimated coefficient value and t value is reported. The results show that the relationship is significant. To confirm, the results of the model tests were used. Among them, the test average variance extracted (AVE) and the coefficient is a good fit. As well as other factors such as NFI and SRMSR are also used to evaluate the goodness of fit that the values of these two parameters, respectively, obtained 6.0 and 0.1. This result indicates a very low error estimate, and it is a good fit [Table 5]. Test AVE: This indicator was proposed by Fornell and Larkr (1981) for this indicator is considered at least 0.5. This means that the hidden variable explains about 50% of the variance of observations. The results showed that the values obtained as follows: 90% for demographic factors, 70% for the geographic factors, and 80% for the main risk factors (values are shown in the blue circle). The results have shown that the average age of drivers was 42.85 years old, the average of work experience was 11.17, and the average of body mass index was 27.8 kg/m 2 8/27 that showed an overweight. According to mean values of 79.5 for diastolic pressure and 119.5 for systolic pressure, the drivers are at risk high blood pressure. The average value of TG equaled 169.08. Moreover, the average value of CHOL equaled 179.98 that is over 150, so in this respect, the drivers are at the border risk. The average value of FBS equaled 96.19 close to the risk, and the deppression equaled 93.47, and the average standard of health is 30–70. The average of smoking equaled 3.46. In addition, according to results of heart disease, on average, 7.8% of drivers suffer heart disease. The results indicate that in addition to the risk factors for cardiovascular disease, demographic factors, and geographical factors also can be used as latent variables intervening on the risk factors for cardiovascular disease impact, as the results come in their impact coefficients the arrows are determined. Demographic factors and negative effects and geographical factors had negative effect, but the effect was not significant. The risk factors and the influence received from demographic and geographic variables affect on cardiovascular disease. As can be seen with increasing age and experience driving, the increased risk factors than shown and with the main variables,,,,,,,,,,,,,,,,,,,,,,,,,,,,,,,,, systolic blood pressure and obesity, abdominal mass, CHOL, and TGs found in this study, heart disease vascular drivers in Tehran in the total population have increased. In addition, by reducing the air temperature and wind speed sports, but most likely increase of the risk factor is low, it is considered a research proposal for future research. 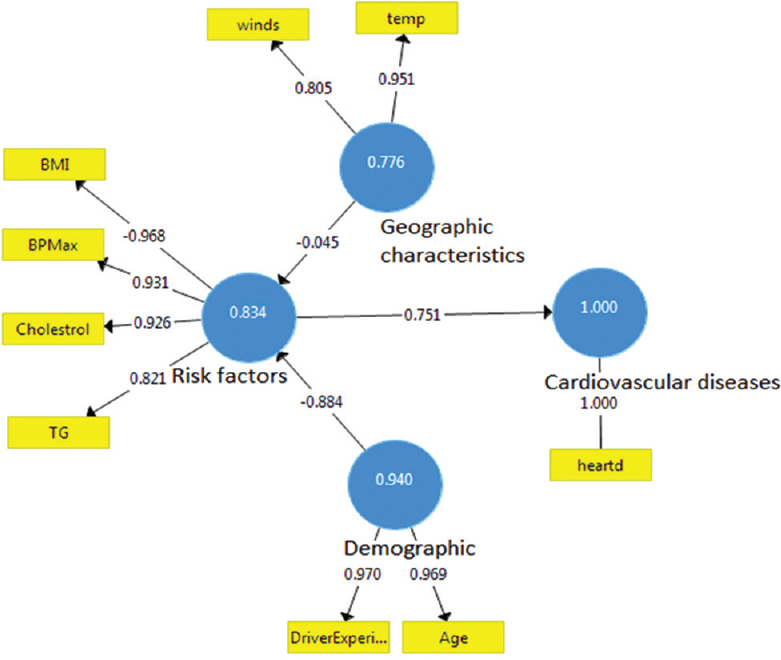 According to the structural model developed in this study, first, the variables to three groups and each with coefficients specified in the scientific management of diseases are important for the cardiovascular impact and probability of risk factors in different provinces due to differences in demographic characteristics and geographical conditions. It is noteworthy that the decision on the macro level in line with regional management is different. As we know, over time, changes are all human and individual circumstances, and futures for a suitable and preventive safety measures should be designed in advance. The research in this area and volume for the first time in the country has been made. This phase or identify hazards and to implement the next phases of management is proposed to be allocated first priority to prevention of risk factors obtained. According to data access drivers' health by province, the studies carried out in all provinces. The health committee in the central building of the road toll and transit countries will be organized for the whole country to manage cardiovascular disease and other diseases with the aim of reducing road accident statistics. The authors would like to appreciate all officials of road transport organization that helped them in conducting this research. The author would also appreciate the professors in the research center of Shahid Rajaei Hospital. The author would also appreciate the professors of different Universities. Lopez A, Mathers DC, Ezzati M, Jamison DT, Murray KJ. Global Burden of Disease. Translated by Shadpour P. 1st ed. Tehran: The Ministry of Health and Medical Sciences; 1998. Naghavi M. The Image of Death in 23 Provinces. The Fourth Book. Tehran: The Ministry of Health and Medical Sciences; 2005.
al-Din AH, Rostamzadeh E. The incidence of myocardial infarction in patients hospitalized C-reactive protein and its relationship with unstable angina in Tohid Hospital in Sanandaj, in 1999. J Kurdistan Univ Med Sci 2000;11:42. Ministry of Health and Medical Education. Center of Noncommunicable Diseases; 2014. Mehdy S, Mohammad S, Faezeh D, Saber M, Mirsaeed A. Evaluation of ischemic heart diseases and related risk factors in professional drivers. Tehran University of Medical Journal. scientific journal articles 2014. Journal of Occupational Health of Iran 2010;3:43-9. Farshidi H, Zare Nejad M, Zare S, Mousavi SA, Mozaffari SA. Evaluation of cardiovascular risk factors drranndgan motor truck cargo terminal at Bandar Abbas (2007-2008). Journal of Birjand University of Medical Sciences (supplementary: cardiovascular) 2013;19:26-32. Kazemi T, Sadeghi-Khorashad M, Salehi A. Evaluation of cardiovascular risk factors among drivers of heavy vehicles in South Khorasan province, 2009-2010. Health Education and Promotion Journal 2014;5:18. Kazemi T, Sadeghi-Khorashad M, Salehi A, et al. Impact of interventions promoting healthy lifestyle taxi drivers in Isfahan. Journal of Birjand University of Medical Sciences (supplementary: cardiovascular) 2013;19:26-32. Pajooh N. Apresident of the Center for the Prevention of Cardiovascular Diseases Shahid Rajaee Hospital. AHA Recommended Strategies for Increasing Cardiovascular Health in Society; 2013. The Medical World. Cardiovascular Disease; 10 September, 2014. Kalantarmotamedi SA. Member of Medical Sciences of God. MI; 2014. Nouhi F. President of the Society of Cardiology. Joint Congr Cardiol 2013;5:18. Sarrafzadegan N. The Department of Cardiovascular Research Center. Isfahan Healthy Heart Program; 2014. Health Department of Medical Sciences, Department of Prevention and Fight against Diseases – Cardiovascular National Program for Prevention and Control; 2014. Department of Kermanshah University of Medical Sciences Strategic Planning, Prevention and Control of Cardiovascular Diseases; 2013. Tehran University of Medical Journal. Scientific Journal Articles 2014.[Persian]. Medical Council of Professionally. Trained Strategic Planning Discipline Cardiovascular Diseases. The Ministry of Health; 2006. Ozdemir L, Turgut OO, Aslan S, Tandogan I, Candan F, Nur N, et al. The risk factors for and prevalence of coronary artery disease in heavy vehicle drivers. Saudi Med J 2009;30:272-8. Wang PD, Lin RS. Coronary heart disease risk factors in urban bus drivers. Public Health 2001;115:261-4. Shin SY, Lee CG, Song HS, Kim SH, Lee HS, Jung MS, et al. Cardiovascular disease risk of bus drivers in a city of Korea. Ann Occup Environ Med 2013;25:34. Sangaleti CT, Trincaus MR, Baratieri T, Zarowy K, Ladika MB, Menon MU, et al. Prevalence of cardiovascular risk factors among truck drivers in the South of Brazil. BMC Public Health 2014;14:1063. Hirata RP, Sampaio LM, Leitão Filho FS, Braghiroli A, Balbi B, Romano S, et al. General characteristics and risk factors of cardiovascular disease among interstate bus drivers. ScientificWorldJournal 2012;2012:216702. Bawa MS, Srivastav M. Study the epidemiological profile of taxi drivers in the background of occupational environment, stress and personality characteristics. Indian J Occup Environ Med 2013;17:108-13. Hartvig P, Midttun O. Coronary heart disease risk factors in bus and truck drivers. A controlled cohort study. Int Arch Occup Environ Health 1983;52:353-60. Trimpon P. Risk Factors for Fractures – A Link between Metabolic Bone Disease and Cardiovascular Disease. University of Gothenburg, Sweden: Institute of Medicine at Sahlgrenska Academy; 2011. Egan BM, Lackland DT. Strategies for cardiovascular disease prevention: Importance of public and community health programs. Ethn Dis 1998;8:228-39. Hornberger J. A cost-benefit analysis of a cardiovascular disease prevention trial, using folate supplementation as an example. Am J Public Health 1998;88:61-7. National Institutes of Health. National Heart, Lung and Blood Institute, NHLBI Obesity Education Initiative. North American Association for the Study of Obesity; 2000. National Center for Chronic Disease Prevention and Health Promotion. Division of Population Health; 2011, 2013. O'Brien Cherry C, Steichen O, Mathew A, Duhot D, Hebbrecht G, Schuster RJ, et al. Aculture of care: The french approach to cardiovascular risk factor management. J Am Board Fam Med 2012;25:477-86. Sholl J, Sinha S. 10 Best Way to Prevent Heart Disease; 2013. Hobbs FD. Cardiovascular disease: Different strategies for primary and secondary prevention? Heart 2004;90:1217-23. CDC. A Public Health Action Plan to Prevent Heart Disease and Stroke. CDC; 2003-2008. CDC. A Public Health Action Plan to Prevent Heart Disease and Stroke. CDC; 2014. Health Systems and Policy Analysis. How can Chronic Disease Management Programmes Operate Across Care Settings and Providers? ; June, 2008. National Heart Disease and Stroke Prevention Program. Division for Heart Disease and Stroke Prevention; September, 2011. CDC. (2012-2016) Action Plan for Impelementation of European Strategy for the Prevention and Control of Noncommunicable Disease. CDC; 2012-2016.
WHO. (2008-2013) Action Plan for the Global Strategy for the Prevention and Control of Noncommunicable Diseases. WHO; 2008-2013.